AXA Insurance has announced 700 job losses across the country. but a company spokesman said very few of these would be at its Haverhill office. The 260 staff at the High Street offices were told of the major company restructuring on Tuesday afternoon. 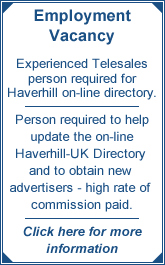 It is estimated up to 16 jobs could go at Haverhill, but it was hoped most of these could he re-deployed within the same office. A spokesman for the company, which took over from Provincial Insurance in Haverhill in 1995, said it was streamlining its operations to offer a better service to customers. Haverhill was likely to escape relatively unscathed, compared to the 320 jobs going at a call centre at Colchester in Essex and another 230 to go in Cardiff. The jobs will go over the next 12 months. The French-owned insurance giant is investing in new IT systems, but cutting back on its car, household and commercial insurance division.